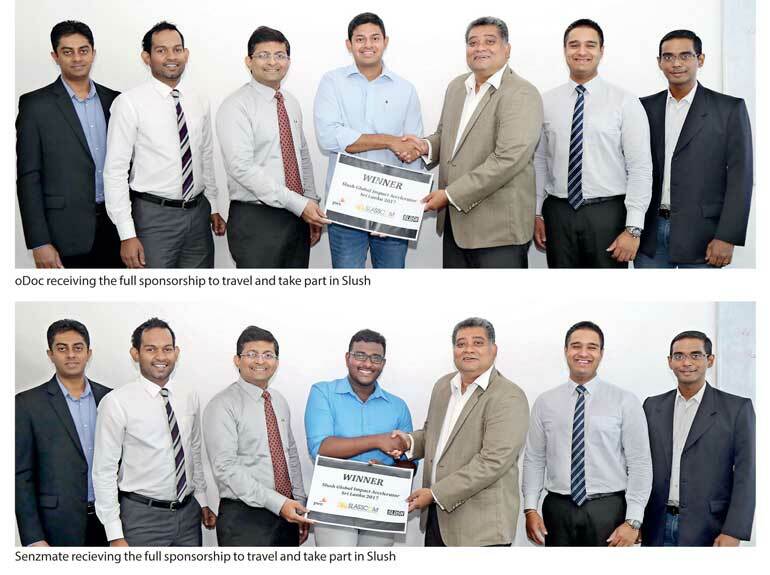 Two unique Sri Lankan startups, SenzMate and oDoc, which uses technology to do business, recently won the SLUSH 2017 Sri Lankan competition and the two winners will fly to Helsinki, Finland to take part at the SLUSH global event in November this year, where over 2,300 startups and at least 1,100 investors from across the world are expected to participate. The local competition was organised this year for a second consecutive year by PricewaterhouseCoopers (PwC) and Sri Lanka Association for Software and Services Companies (SLASSCOM), with the objective of finding the best impact oriented startups in the country. Slush Global Impact Accelerator (GIA) is a program created in collaboration with the Ministry for Foreign Affairs of Finland and other multiple partners globally. The purpose is to support impact driven startups and showcase the exciting business opportunities in emerging markets, which are also vital for implementing the Agenda 2030 and solving complex challenges. In addition, the program focuses on strengthening the networks between the impact actors, engaging the Nordic community with the global impact entrepreneurs, and enhancing the mobilisation of capital towards impactful business. GIA 2017 brings impact-driven entrepreneurs from emerging markets to Helsinki to accelerate their business, attract additional financing, and build long-lasting networks. The program includes online pre-event coaching and Helsinki Boot Camp program from November 25– December 2, 2017 culminating in Slush. SenzMate is a Sri Lankan based Internet of Things (IoT) and Machine to Machine (M2M) Solutions Company that provides end to end solutions for enterprise applications with 100% local knowledge and state of the art innovation. The startup offers the best of breed solutions and framework that enables IoT communication like no one else offers in the market at present. SenzMate provides its clients the ability to harness the power of “Internet of Things” and achieve multi fold improvement in effectiveness of business processes. oDoc is an app that connects patients with doctors for video consultation and care. oDoc is unique because if provides medical advice and instant e-prescriptions into the palm of the patient’s hand instantly. By combining cutting-edge mobile and AI technology with the best clinical expertise, oDoc enables patients to book appointments in seconds, upload photos and lab tests and see a doctor on demand, from wherever they are, and whenever they want. oDoc is based in Colombo and was founded by medical doctors, Stanford PhD’s, mathematicians and senior corporate executives. Senzmate Miller CEO Alexander Rajendran and oDoc Co-Founder and CEO Heshan Fernando will fly to Helsinki, Finland to take part at the global event which will take place from 30 November to 1 December. The winners at the Sri Lankan competition were adjudged following a grueling judging process and in two rounds. During the first round, startups were asked to pitch their ideas to a panel of judges from the industry. The judges subsequently shortlisted three of the best startups based on the SLUSH Global Impact Accelerator selection criteria, and subsequently the SLUSH Final Selection Committee, in Helsinki selected the best two Sri Lankan startups after conducting live interviews. A total of 33 local startups took part in the pitching event which was held in September this year in Colombo. SLUSH is a program created in collaboration with the Ministry of Foreign Affairs of Finland and other global multiple partners. The objective of the annual event is to support impact-driven startups from across the globe and showcase exciting business opportunities in emerging markets. SLUSH was introduced to Sri Lanka last year by PwC Sri Lanka in collaboration with SLASSCOM, which has been the exclusive SLUSH hub manager in the country since 2016. PwC has been sponsoring SLUSH since 2010 and in 2015 PwC became SLUSH’s first global sponsor. Along with SLUSH, PwC plays an active role in developing startup ecosystems around the world and supporting the most promising companies from day one to IPO and beyond.Executives around the globe are looking to entrepreneurs and the startup scene to accelerate growth in the digital age. Bringing the gap between executives and founders can be a challenge, that’s where PwC can help. As a trusted facilitator, PwC helps to build powerful collaboration between startups, investors, executives and influencers around the world. This program aims to create a leading global accelerator to support startups that are looking to solve some of the most pressing global challenges and contributing to the discussion on impact investing. As a part of the collaboration, PwC is committed to support SLUSH’s expansion worldwide. It provides a win-win opportunity to work with fast-moving and ambitious companies at the start of their lifecycle and with more established companies looking to build entrepreneurial businesses within their existing business.